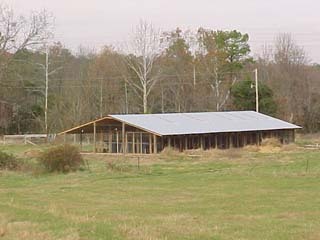 The Avian Research Facility (ARF) is a large pole barn aviary built by the Department of Biology at a secluded location on the field station. Dr. Buchholz directs the use of the facility. The aviary is divided into two sections: a large free-flight cage approximately 8′ tall, 90′ long. 20′ wide, and 32 individual pens that are 8′ tall, 6′ long, 4′ wide. 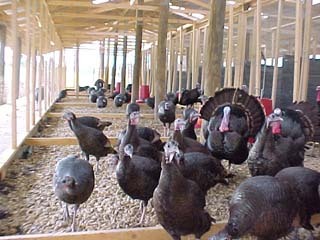 Cement walkways surround the pens, which have a river gravel substrate. The roof of the aviary keeps the pens dry, but they are exposed to daily fluctuations in ambient temperature, sunlight and wind. There are ground fault protected electrical outlets, incandescent lighting, and potable pressurized well water. At this time the ARF is used exclusively for research on the behavior, genetics, endocrinology, parasitology and immunology of the wild turkey (Meleagris gallopavo). In the future, research consistent with on-going projects, facility limitations, and the requirements of the Department of Biology and the University of MS Field Station, will be considered. Contact Dr. Buchholz (byrb@olemiss.edu) for more information about on-going projects or the possible use of the facility.